Background and Objectives: The present study was undertaken to compare and evaluate the area increase of root canals with ProTaper, iRaCe and Revo-S systems using cone beam computed tomography for analysis. Materials and Methodology: Forty five extracted human mandibular premolars having single canal and straight root were collected. Teeth were randomly assigned to three groups (n=15). Samples were decoronized by maintaining root length at 14 mm. Pre-instrumentation cone beam computed tomography scan was done after stabilizing the samples on wax blocks. The working length was determined at 1 mm short from the apical foramen by using a ISO 15 K-file tip protruding at apical foramen. Preparation was carried out according to the manufacturer's instructions. Finally, canals were instrumented upto 30/.06 apically for each group. After each instrumentation, root canals were irrigated with 2ml of 3% sodium hypochlorite solution followed by 2 ml of 17% EDTA solution. Final irrigation was done with 5ml of saline. Post instrumentation cone beam computed tomography scans of all samples in the 3 groups were acquired. Results: Mean percentage of area increase in different thirds of the canal was highest for ProTaper followed by i-RaCe and Revo-s system which was statistically significant. Interpretation and Conclusion: Root canal area increase was highest for ProTaper followed by i-Race and Revo-S systems. Radiographic examination is essential in diagnosis and treatment planning in endodontics. Conventional radiographic technologies provide two-dimensional representations of three-dimensional (3D) objects. , To overcome the shortcomings of conventional radiographs, advanced digital imaging modalities were introduced in dentistry, one of which is cone-beam computed tomography (CBCT). Thus, acknowledging the importance of preserving the remaining dentinal thickness through proper usage of various instrument systems, the purpose of this study was to compare and evaluate the area increase of root canals using three different Ni-Ti rotary systems ProTaper, i-RaCe, and Revo-S systems. Forty-five freshly extracted human mandibular premolars having single canal and straight root were collected. Samples were stored in normal saline solution until use. They were randomly divided into three groups containing 15 specimens in each of them. Buccal and proximal radiographs (Dental Intraoral E-speed films) were made to ensure that the teeth had only one canal. Samples were decoronized by maintaining root length at 14 mm. 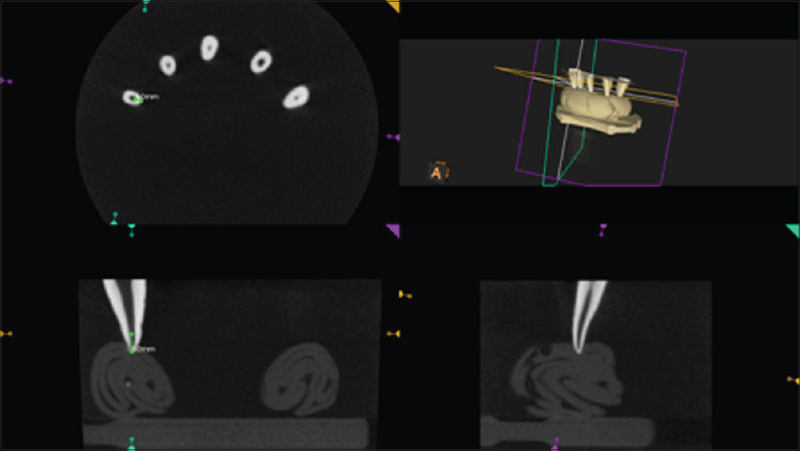 Preinstrumentation CBCT scan was done after stabilizing the samples on wax blocks [Figure 1] [Figure 2] [Figure 3]. The working length was determined at 1 mm short from the apical foramen using an ISO 15 K-file tip protruding at apical foramen. All root canals were widened to an ISO 20 K-file (Denstply, Maillefer) inserted with balanced force movements through the working length, avoiding apical pressure, and under abundant irrigation. Rotary instruments were used with Endomate DT (NSK, Japan) according to manufacturer's recommendation. For ProTaper (Dentsply Maillefer) group, first SX instrument was used up to one-third of the working length and proceeded with S1, S2 instruments at 300 rpm and a torque of about 3 Ncm till two-third of the working length. This was followed by instrumentation with F1, F2, and F3 up to the working length, avoiding apical pressure, and applying gentle strokes against the canal walls. For i-RaCe group, instruments were used in a crown-down manner at 600 rpm and a torque of 2 Ncm. File sequences used were: Size 15/0.06 was used up to working length, followed by sizes 20/0.04, 25/0.06, and 30/0.06 all up to the working length. Size 15 K-file was used at the working length between each file in order to prevent the apical blockage. For Revo-S (Micro-Mega) group, instruments were used with a rotation speed of 400 rpm and a torque of 2 Ncm. Instrument sequence used were: Size 25/0.06 up to two-third the working length, sizes 25/0.04 and 25/0.06 until the apex was reached. This shaping was done in free progressive strokes without pressure. Finally, canals were instrumented up to size 30/0.06 for apical finishing. Recapitulation with smaller size files was done during chemomechanical preparation. After each instrumentation, root canals were irrigated with 2 ml of 3% sodium hypochlorite solution (Vensons, Bengaluru, India) followed by 2 ml of 17% EDTA solution (Deor Care, Kerala, India). Final irrigation was done with 5 ml of saline (Claris Lifesciences, Ahmadabad, India). After each rinse, an ISO 10 K-file was inserted inside the canal to check apical patency. Postinstrumentation CBCT scans of all samples in the three groups were acquired. The images were saved and were edited with CS3 Photoshop software (Adobe Systems Inc.), recorded in Tagged Image File Format and analyzed by Image Tool 3.0 software for Windows software (University of Texas Science Center, USA). The area of each canal was measured at the apical (3 mm from the tip of the radiologic apex), middle (5 mm from the tip of the radiologic apex) and cervical (7 mm from the tip of the radiologic apex) thirds before and after instrumentation for comparison among the three rotary systems as well as to evaluate the area increase in the three-third of the canal [Figure 4] [Figure 5] [Figure 6]. Data were analyzed using one-way ANOVA test for multiple comparisons followed by Tukey's post-hoc test for group comparisons. Comparisons of area measurements before and after instrumentation were carried out by Student's t-test. [Table 1] and [Table 2] shows the means and standard deviations in root canal area for each system pre- and post-operative values at different thirds. [Table 3] depicts mean percentage of area increase in different thirds of the canal for each system. At apical third, the mean percentage of area increase was highest (P < 0.05) with ProTaper (36.921) followed by Revo-S (30.76) and least with i-RaCe (29.70). Similarly, at the middle third and coronal third, the mean percentage was highest for ProTaper (31.43) and (33.16) followed by Revo-S (30.33) and (30.71) and least with i-RaCe (28.79) and (28.78), respectively. Various studies have investigated the efficiency of Ni-Ti rotary instruments, but few have examined the ability to increase root canal area. In the present study, three Ni-Ti rotary systems namely ProTaper, i-RaCe, and Revo-S were used to investigate the canal area increase before and after instrumentation. The i-RaCe instruments have alternating cutting edges, and this design is alleged to have two functions: (i) To eliminate screwing in and blocking in continuous rotation and (ii) to reduce the working torque. In the present study, Revo-S and i-RaCe seemed to remove the less dentin from both middle and coronal portions compared to ProTaper, which is statistically significant and in accordance with previous studies. No file separations occurred in the present study. However, studies have showed that ProTaper systems are more prone to file separation. In the present study, we have used CBCT, which provided a practical and nondestructive technique for assessment of canal morphology before and after shaping according to Gluskin et al. 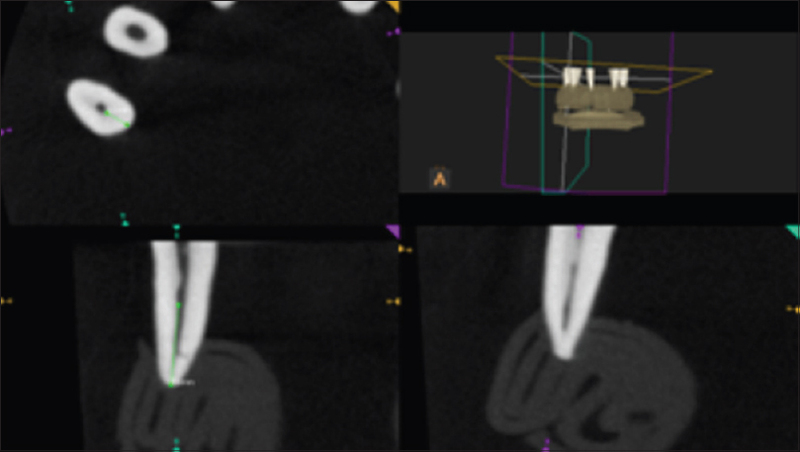 Cone-beam computed tomography image analysis software was used which allowed pre- and post-instrumentation measuring of root canal area increase. Under the circumstances of this current in vitro study, it suggests that ProTaper showed maximum canal area increase in middle and coronal thirds of the root canal compared to i-RaCe and Revo-S systems which were statistically significant. On the other hand, i-RaCe had removed the least dentin compared to ProTaper and Revo-S systems. Moreover, the mean percentage of area increase showed that ProTaper achieved the most followed by Revo-S and i-RaCe systems. Further research is needed in order to confirm and elaborate on its canal transportation, uninstrumented surface area, and preservation of dentin thickness which affects the prognostic stability of the teeth. Danforth RA, Dus I, Mah J. 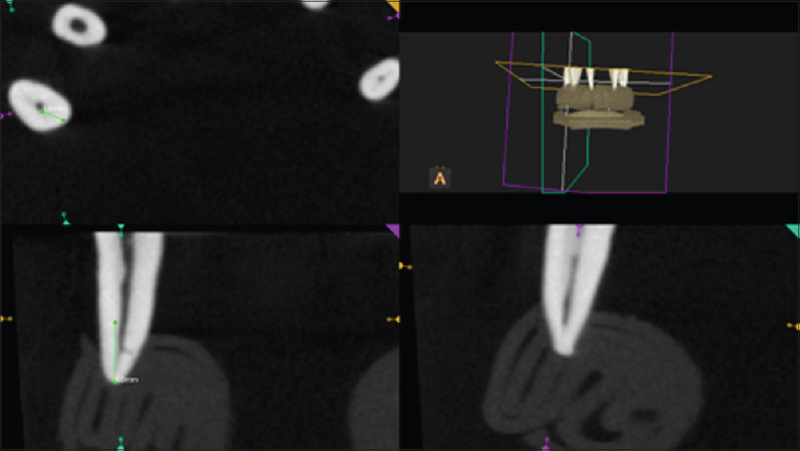 3 D volume imaging for dentistry: A new dimension. J Calif Dent Assoc 2003;31:817 23. Mohammadzade Akhlaghi N, Khalilak Z, Baradaran Mohajeri L, Sheikholeslami M, Saedi S. Comparison of canal preparation pattern of K3 and ProTaper rotary files in curved resin blocks. Iran Endod J 2008;3:11 6. Uzun O, Topuz O, Aydýn C, Alaçam T, Aslan B. Enlarging characteristics of four nickel titanium rotary instrument systems under standardized conditions of operator related variables. J Endod 2007;33:1117 20. Uyanik OM, Cehreli ZC, Mocan BO, Dagli FT. Comparative evaluation of three nickel titanium instrumentation systems in human teeth using computed tomography. J Endod 2006;32:668 71. Hashem AA, Ghoneim AG, Lutfy RA, Foda MY, Omar GA. Geometric analysis of root canals prepared by four rotary NiTi shaping systems. J Endod 2012;38:996 1000. Berutti E, Chiandussi G, Paolino DS, Scotti N, Cantatore G, Castellucci A, et al. Canal shaping with WaveOne Primary reciprocating files and ProTaper system: A comparative study. J Endod 2012;38:505 9. Paqué F, Musch U, Hülsmann M. Comparison of root canal preparation using RaCe and ProTaper rotary Ni Ti instruments. Int Endod J 2005;38:8 16. De Deus G, Garcia Filho P. Influence of the NiTi rotary system on the debridement quality of the root canal space. Oral Surg Oral Med Oral Pathol Oral Radiol Endod 2009;108:e71 6. Nair MK, Nair UP. Digital and advanced imaging in endodontics: A review. J Endod 2007;33:1 6. Scarfe WC. 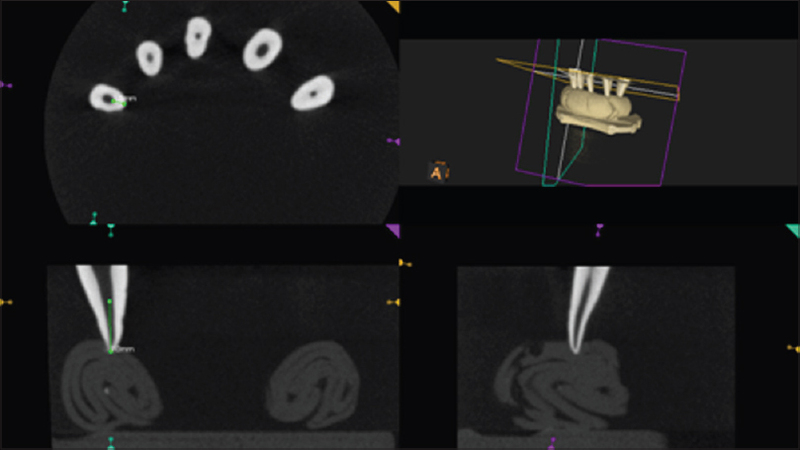 Use of cone beam computed tomography in endodontics. Oral Surg Oral Med Oral Pathol Oral Radiol Endod 2011;2:234 7. Dayal C, Sajjan GS. Imaging solutions in endodontics: Cone beam computed tomography A review. Endodontology 2012;24:167 70. Barnett F, Endo C, Serota KS. Small focal field volumetric cone beam tomography: The new standard of care in foundational dentistry? Oral Health J 2010 ;6:50 63. Bernardes RA, Rocha EA, Duarte MA, Vivan RR, de Moraes IG, Bramante AS, et al. Root canal area increase promoted by the EndoSequence and ProTaper systems: Comparison by computed tomography. J Endod 2010;36:1179 82. Ounsi HF, Franciosi G, Paragliola R, Al Hezaimi K, Salameh Z, Tay FR, et al. Comparison of two techniques for assessing the shaping efficacy of repeatedly used nickel titanium rotary instruments. J Endod 2011;37:847 50. Stern S, Patel S, Foschi F, Sherriff M, Mannocci F. Changes in centering and shaping ability using three nickel titanium instrumentation techniques analysed by micro computed tomography (μCT). Int Endod J 2012;45:514 23. Peters OA, Peters CI. Cleaning and shaping of root canal system. Cohen's Pathways of the Pulp. 10 th ed. Elsevier; 2011. p. 290 357. Yoshimine Y, Ono M, Akamine A. The shaping effects of three nickel titanium rotary instruments in simulated S shaped canals. J Endod 2005;31:373 5. Paqué F, Balmer M, Attin T, Peters OA. Preparation of oval shaped root canals in mandibular molars using nickel titanium rotary instruments: A micro computed tomography study. J Endod 2010;36:703 7. Bürklein S, Hinschitza K, Dammaschke T, Schäfer E. Shaping ability and cleaning effectiveness of two single file systems in severely curved root canals of extracted teeth: Reciproc and WaveOne versus Mtwo and ProTaper. Int Endod J 2012;45:449 61. Scarfe WC, Farman AG. Cone beam computed tomography. In: White SC, Pharoah MJ, editors. Oral Radiology: Principles and Interpretation. 6 th ed. Mosby; 2009. p. 225 43.